You might goto www.aeronca.com and check the photo section also take a look at www.myplaneonline.com and look under aeronca check photo's of members. Jim Vincent has a bunch of pics on his website from when he re-did his panel. I am using RAM mounts for most everything. The GPS is on a Suction Cup mount on the top of the panel as well as the iPhone. My ICOM A20 on another plane and the A24 on this plane is mounted on a RAM belt clip mount. It can be mounted with just one screw for the 1" ball or with a 2 screw ball mount. Work great. I agree with Robert's approach. I'm using RAM mounts for my Garmin 396; my ICOM IC-A22; and for my beer can (I mean POP CAN) holder. If you google RAM mounts, you can locate a wizard that will help select the RAM mount you need. 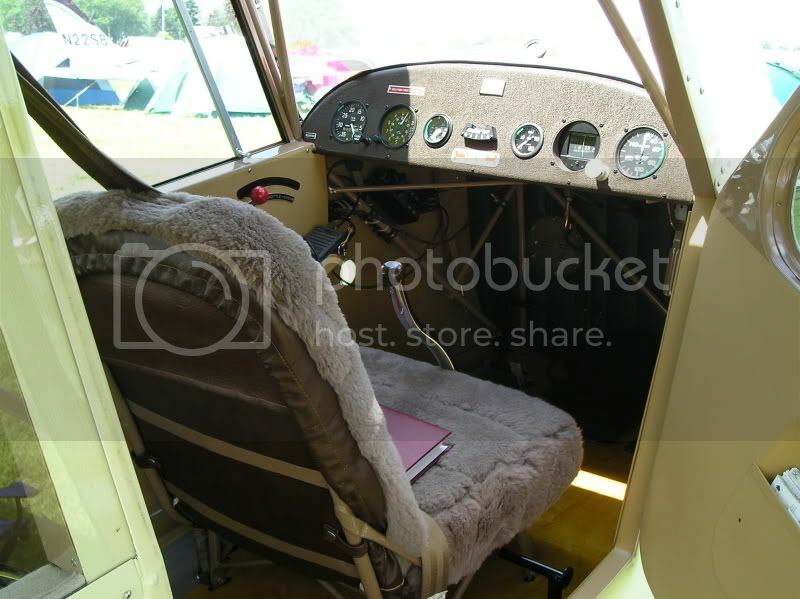 This is not my plane, it's owned by a guy from IN and was at Oshkosh 2010. It's not real clear but he had his mounted out of the way on the side panel. I know most people would like to have them right in front of them and in plain sight, but not me. I also prefer them out of sight of other people when at fly-ins. It keeps them a little less obvious to some who might have sticky fingers. Another reason I don't like adding anything extra to the panel is that it might become a skull splitter some day. Good point, which is why I put in Shoulder Harnesses. I had mine originally mounted on a piece of plexiglass (90% bend to make a mounting shelf) on the side panel down far enough to not interfer with the throttle, but both my A20 and A24 have VOR capability and I have to look down too much in order to change VORs etc. Let me see if I have an old picture of the side mount. Here is how a radio was mounted when I bought the plane and how a friend uses an alumunum box screwed to the side wall in about the same place to hold his. The Belt Clip on the Radio holds it in place. I"ve put them up in the L/H wing root area. It keeps the cords up and out of the way. That is where I've put mine. High on the left. Use a velcroed aluminum backing plate with a bale for the belt clip. Easy to reach for PTT, and easy to bring down if I need to realy study it. Out of sight but easy to use.